Did you need one more reason to go to AU? Okay, here it is! AU is launching an "Economic Stimulus" program to help more people get to AU. Starting on November 5th, anyone with a non-discounted AU pass can request a Buddy Pass, which provides full access to all AU events, but without hotel (so maybe pick a “buddy” who you wouldn't mind sharing a room with) or pre-registration of classes. It might be a bit tough to get into labs without pre-registering (although you can always try), but there's almost always extra seats in the lecture classes. The Buddy Pass program begins at 9:00 EST on November 5th, and the first 100 requested will be free! After that, they're just $595 -- really a bargain. For more on Buddy Passes, check out the AU website. The LT team is looking for images of start-to-finish designs created in LT. If they started out as a hand-sketch, so much the better. An example would be a sketch of a building facade, the same elevation drawn in LT, and a photo of the finished product. Or the same type of images for a mechanical part, or a landscape design, or anything cool that was drawn in LT and turned into a finished product. If you have cool stuff like that (and I bet you do! ), and would be willing to talk with us about getting some images, drop me an e-mail: kate.morrical@autodesk.com. Think that AU isn't for LT? Think again! So I'm positive you've heard of AU before, and I'd be willing to bet that you thought, "Oh, AU, there's nothing for LT there. It's all about AutoCAD and verticals." Well, I've been to several AU's now, and I can tell you that that's not the case at all. There's plenty for an LT user to do, see, and learn. To prove it, I've gone through the schedule and pulled out classes that would be relevant to LT people from any industry. There are several CAD Management classes, a few on Customization, and a bunch more on features like fields and dynamic blocks. There were only two blocks of time (out of 15) where there weren't good LT classes, and one of those is full of different industry-related keynote addresses (so nobody really has classes there). For that last block, you could always find another class related to your industry, and learn about other Autodesk products that are used in it -- or you could just take a break and get ready for the Beer Bust that evening. Here's my sample schedule. Most slots have more than one class listed -- I wanted you to see all the options you had. And there's even more than are listed here -- I just picked the major ones. CP315-2: Customization 101: AutoCAD and AutoCAD LT. This one's my class! CP115-2L or CP101-5L: Custom Object Snaps and Other Geometry Calculator Tricks in AutoCAD®. This one's taught by Darren Young, and I'm one of the lab assistants. CD311-1 Extreme DWF™: Top 10 Ways You Can Upgrade your Workflow using DWF and Autodesk® Design Review. This is all about electronic drawing review, and is taught by my colleague Cliff Medling. And there are many more where those came from! An LT user should have no problem filling up a schedule with good classes. If the price has you worried, yes, I know it look steep, but remember that it includes the hotel and almost every meal. That means the total cost is completely in line with similar events, or even less. Hope to see you at AU! Everybody has a list of features they'd like to see in AutoCAD and AutoCAD LT.
Now is your chance to vote for your favorites, and see the winners get sent directly to us here at Autodesk. A lot of features in recent releases have been directly influenced by wishlist voting, so make your voice heard! Vote soon -- polls close on October 31st. Any Readers in the San Francisco area? Autodesk Labs is a division of Autodesk that engages in exploring all sorts of cool and new technologies. One of our goals is to gather feedback about these upcoming technologies that, we think, have great potential for our customers. Autodesk recently opened a brand new Usability Lab in our office in San Francisco, and Autodesk Labs will conduct a usability study on October 30th and 31st. I would like to personally invite you to participate in this study, which will be all about rating new delivery methods for our heavy desktop applications. The study will involve rating the user experience through a series of small exercises using AutoCAD 2009 and/or Inventor 2009, and will take a maximum of 1.5 hours. Previous experience with either product is not necessary. Please contact me by email If you would like to participate in the survey (Frederic.Loranger@autodesk.com). I’ll make sure to provide you with a time slot that fits your schedule. Be the first on your block to test-drive a new product! I hope if you have a few extra hours you'll consider signing up. You get New, Open, Save, Plot, Undo, and Redo -- but what if you want to put something else up there? No problem! Simply right-click on the Quick Access Toolbar and select "Customize." 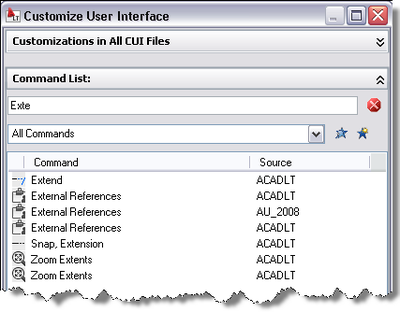 A condensed view of the CUI pops up, enabling you to browse for the command you want or search the command list for it. Once you see the command you want, just drag-and-drop it into the Quick Access Toolbar. If you change your mind, you'll need to go into the full CUI editor to take a command off the toolbar. Under the contents of each workspace is a node for the Quick Access Toolbar. Click on "Customize Workspace" to make changes, and on "Done" when you're finished. Notice that this means that you could have a different Quick Access Toolbar for each workspace, if there are times when you need quick access to different sets of commands. I learned something new about Dynamic Blocks this week, so I thought I'd share it with you. You probably know that you can use the Properties palette to change the custom properties of inserted dynamic blocks (like picking an option from a lookup table, or entering a value for a linear parameter). But did you know that you can use the Properties palette to change those settings before you pick your insertion point? Try it: Begin to insert a block (from a menu, tool palette, or with the insert command), but before you pick your insertion point, open up the Properties palette. Look for the section called "Custom" -- this holds the parameter-based properties for your block. Change one of them, and watch the preview of your block update before you place it. Anyway, I thought that was a pretty neat tip. I hope some of you find it useful!